As more patient information takes an electronic form, physicians must work with computers efficiently and effectively to provide the best care. To help physicians not just use but shape the course of electronic medical record systems and health information exchange, the Regenstrief Institute and the Department of Emergency Medicine at the IU School of Medicine are offering one of the nation's first accredited clinical informatics fellowship training programs. 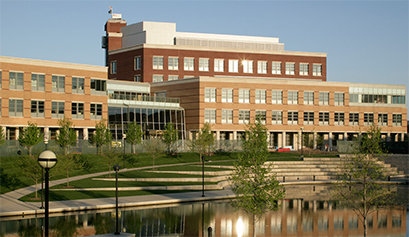 The new Regenstrief-IU fellowship program, which is available to physicians in any medical specialty, focuses on a rapidly growing interdisciplinary field merging medicine and computer science and on the collection and use of electronic patient data to improve delivery of health care, with the goal of improving the health of individuals and entire populations. "The nation is very rapidly moving towards 'digitizing' health care," said Titus Schleyer, DMD, Ph.D., Clem McDonald Professor of Biomedical Informatics at the IU School of Medicine and director of the Center for Biomedical Informatics at the Regenstrief Institute. "Electronic health records have had huge benefits, but there are also a lot of bumps in the road. Physicians are largely very dissatisfied with EHRs as tools for their daily work. Individuals trained in clinical informatics can help chart the way to a better future." The director of the new IU-Regenstrief fellowship program is John T. Finnell, M.D., associate professor of clinical emergency medicine at the IU School of Medicine and investigator at the Regenstrief Institute. The program is accredited by the Accreditation Council for Graduate Medical Education as part of an initiative of the council and the American Board of Anesthesiology, the American Board of Emergency Medicine, the American Board of Family Medicine, the American Board of Genetics and Genomics, the American Board of Internal Medicine, the American Board of Pathology, the American Board of Pediatrics, the American Board of Preventive Medicine and the American Board of Radiology. Dr. Schleyer also serves as director of the biomedical informatics core of the Indiana Clinical and Translational Sciences Institute. The Indiana Alzheimer Disease Center will present its 2015 Scientific Symposium, "Network Science and Alzheimer's Disease," from 8 a.m. to 2:45 p.m. Friday, March 6, in the IU Health Neuroscience Center (Goodman Hall) Auditorium. This annual symposium is designed to help scientists and clinicians to better understand the complex multi-level systems involved in Alzheimer’s disease, from altered brain connectivity and gene networks to the social networks surrounding patients and caregivers. This event will also feature "state-of-the-science" presentations from Indiana Alzheimer Disease Center researchers, including Joaquin Goñi, Ph.D.; Vijay Ramanan, Ph.D.; and Li Shen, Ph.D. In addition, symposium attendees are invited to submit abstracts highlighting their research related to Alzheimer’s disease or other dementias, with up to 10 authors being invited to present their poster during the morning session. Space will be available to display posters throughout the day. Abstracts of 250 words are due Monday, Feb. 16. Submit abstracts to iadc@iupui.edu. This symposium is offered free of charge; however, registration is required. Questions to Donna Wert at 317-963-7297 or dwert@iupui.edu. A common, yet previously undistinguished protein, which is elevated in many late-stage cancers, may play a strategic role in tumor growth through a non-conventional pathway, researchers at the IU School of Medicine report in the Feb. 10 issue of the Proceedings of the National Academy of Sciences. “This work provides new evidence on the mechanism through an unrealized pathway that can spur on cell growth and metastasis," said Lindsey D. Mayo, Ph.D., associate professor of pediatrics, biochemistry and molecular biology, a scientist at the Herman B Wells Center for Pediatric Research at the IU School of Medicine and a researcher at the IU Simon Cancer Center. Previously, Dr. Mayo and colleagues identified a critical pathway that stimulates the production of Mdm2 causing an increase in the level of protein that binds to p53, the most common tumor suppressor, as well as other tumor suppressors, and extinguishes tumor suppression activity. Since elevated levels of Mdm2 are found in late-stage cancers, the IU researchers began to test what elevated Mdm2 was doing in the cells. The tumor uses Mdm2 to either destroy p53, or put p53 in suspended animation. The suspended animation is the revelation that Dr. Mayo’s laboratory discovered in the recently published work. Co-authors on the PNAS article are Christopher N. Batuello, Ph.D; Paula M. Hauck, Ph.D.; Jaimie M. Gendron; and Jason A. Lehman, Ph.D. This work was funded by the National Cancer Institute with pilot funding from Riley Children’s Foundation and a research support funds grant from IUPUI. According to a new study from the Regenstrief Institute and IU Center for Aging Research study, low-income obese white women uniformly report that weight negatively affects their lives, while half of their black contemporaries are comfortable with obesity. "For both the black and white women we interviewed, food was cen­tral to social life and pleasure," said NiCole Keith, Ph.D., the study author and a physical activity researcher who focuses on health disparities such as race, age and socioeconomic status and on preventive health interventions. "Understanding how low-income urban middle-aged women feel about weight and the perceived social pressures to lose weight is important to reaching this high-risk and complicated -- in terms of weight loss -- population." The study, which appears in the January-February 2015 issue of the American Journal of Health Behavior, also found that none of the black women who participated in the study reported felt external pressure to lose weight from friends or family members, compared to three-quarters of the white women. Ninety-one percent of white women in the study versus 69 percent of black women also believed obesity to be an inherited trait, suggesting they thought nothing can be done to prevent it. Study resulted were based on in-depth home in­terviews conducted with 16 obese black and 11 obese white women who failed to attend Healthy Me, a free Eskenazi Health lifestyle weight loss program to which they had been referred by their health care provider at one of Eskenazi Health's nine urban clinics. Dr. Keith is an associate professor of kinesiology in the School of Physical Education and Tourism Management at IUPUI and vice president of the American College of Sports Medicine. She is also an investigator at the Regenstrief Institute and scientist with the IU Center for Aging Research. Additional study authors were Kimberly Hemmerlein, B.A., and Daniel O. Clark, Ph.D. of the Regenstrief Institute and IU Center for Aging Research. The study was funded by National Institute of Diabetes and Digestive and Kidney Diseases. Chandy C. John, M.D., who recently joined the IU School of Medicine from the University of Minnesota, has been named the second holder of the Ryan White Professorship in Pediatrics, effective Feb. 1, pending Board of Trustees approval. Dr. John is also a professor of pediatrics and a professor of professor of microbiology and immunology at the IU School of Medicine. His recruitment to IU was supported by resources from the Physician Scientist Initiative, which was funded by the Lilly Endowment. A faculty member in the field of pediatric infectious diseases and section chief of pediatric disease in the Department of Pediatrics, Dr. John investigates malaria immunoepidemiology, the pathogenesis of severe malaria and interactions between malaria and other disease states, such as iron deficiency and sickle cell disease. His lab conducts research at IU, Uganda with Makerere University and Kenya with the Kenya Medical Research Institute and Maseno University. He earned his medical degree, as well as a bachelor's degree in pre-medicine, from the University of Michigan in Ann Arbor, Mich., and a master's in epidemiology from Case Western Reserve University in Cleveland, Ohio, where he also served a fellowship in Pediatric Infectious Diseases Fellowship at Rainbow Babies & Children’s Hospital. He served his residency in internal medicine and pediatrics at the University of Michigan. The Ryan White Professorship in Pediatrics was established by the Riley Memorial Association, now the Riley Children's Foundation, to benefit the Section of Pediatric Infectious Diseases in the Department of Pediatrics. The professorship is named in honor of a patient at Riley Hospital for Children at IU Health who became nationally known for his fight against hemophilia, and later the ravages of Acquired Immune Deficiency Syndrome (AIDS), and who spent his last days at the hospital after seven years of treatment. The first holder of the professorship was Martin B. Kleiman, M.D. Kathy D. Miller, M.D., has been named the second holder of the Ballvé Lantero Chair in Oncology, effective Feb. 3, pending Board of Trustees approval. Dr. Miller's title of Ballvé Lantero Scholar in Oncology will be changed to Ballvé Lantero Professor of Oncology. She will also retain her current title of professor of medicine. An IU faculty member in the field of oncology and a member of the Indiana University Melvin and Bren Simon Cancer Center, Dr. Miller specializes in the research and treatment of breast cancer, including testing therapies through clinical trials of new chemotherapy agents, including anti-angiogenic agents that reduce the blood supply to tumors. She earned her medical degree from Johns Hopkins School of Medicine, where she also served a residency in internal medicine, and served a fellowship in hematology/oncology at the IU School of Medicine. She also holds a bachelor's degree in biology from the University of Miami. The Ballvé Lantero Chair in Oncology was established by the Ballve Lantero family in 1996 to honor the memory of Jose Luis Ballvé, whose life was an example of good work and good deeds and who was treated for cancer at the IU Medical Center. During his lifetime, Ballvé showed special interest in helping highly talented individuals and those whose disabilities demanded the most attention. His family established an endowment to allow its beneficiaries to follow paths of investigation and dedication, particularly in the area of cancer research. The first holder of the Chair was George W. Sledge, Jr., M.D. The IU Grant Linking University-wide Expertise, or GLUE, Awards will provide up to $100,000 to support the cross-campus development of multi-investigator and/or multi-project translational research teams that aim to submit multi-year extramural grant applications with annual budgets of $500,000 or higher. For example, NIH Project Planning Grants, "U series" grants, multi-PI R01s, Small Business Technology Transfer grants or Specialized Programs of Research Excellence grants. The Indiana Pacers will honor IU physician scientists Lawrence Einhorn, M.D., and Nasser Hanna, M.D., for their contributions to testicular cancer research during their game against the Houston Rockets on Monday, March 23. The Indiana Heroes Award program presented by Citizens Energy Group serves as one of the premier community outreach programs of the Indiana Pacers. This program honors individual who have made an overwhelming impact on the lives of others, and who, through their commitment and humanitarian spirit, have make exceptional and lasting contributions to the community and state. During the first timeout in the second quarter, Drs. Einhorn and Hanna will be honored at the center of the court. Dr. Einhorn is the Livestrong Foundation Professor of Oncology and professor of medicine at the IU School of Medicine. Dr. Hanna is associate professor of medicine at the IU School of Medicine. Both physicians are members of the IU Simon Cancer Center. Doors open at 6 p.m. and tipoff is 7 p.m. at Bankers Life Fieldhouse. Tickets are $16 for upper balcony, $30 for lower balcony and $75 for club level corner. To order tickets, visit the Pacers website and enter the code "Pacers." Proceeds from ticket sales will go to testis cancer research at IU.